As cars become more and more connected, the risks to security increase. Before connected cars, intruders needed physical access to a vehicle to tamper with it. Today, the various wireless access points provide a greater working surface for hackers. 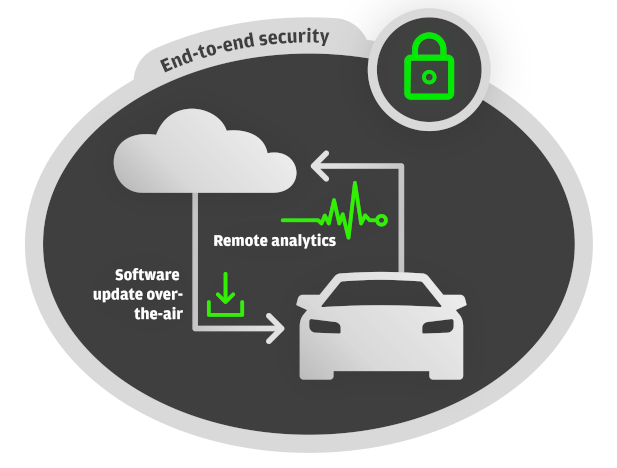 EB puts extensive resources and efforts to securing vehicles and helping car makers to ensure security in their software projects. EB works with automotive manufacturers to implement security principles such as “no security by obscurity,” and assume attacker will know the system as well as the manufacturer’s own developers and employees do. Secure connections are the cornerstones in new business models for solutions like remote diagnostics. EB’s security solutions, already on the road in millions of cars, provide that solid foundation. Automotive companies can and should learn from other industries which have dealt with cybersecurity for longer. But some issues remain specific to the automotive industry. EB is a trusted partner having worked on security in the automotive industry for over two decades. We understand the security requirements for safety relevant features. Secure connections provide the basis for future innovations. Those innovations rely on connectivity, which must provide a secure path from the vehicle or fleet to the server. To create a secure vehicle, you have to consider all the connected elements and take a holistic approach. EB looks at security as a whole across all the different ECUs, servers, and systems involved in your solution. Consumers are more and more concerned about their privacy. They know that the features offered in your connected cars affect that privacy. To keep their trust, carmakers must ensure privacy throughout the data life cycle. Signals exchanged are used in functional safety applications as well as in applications that are potentially subject to security issues. A comprehensive, hardware-agnostic software solution for highly-automated driving systems.